September 2d. We all move forward toward the city of Atlanta, leaving our tents standing. Our regiment has the advance, and the Fifth Regiment Connecticut Veteran Volunteers have the honor of being the first Union regiment to march through the streets of the city of Atlanta. We have certainly earned the honor, for we have made a long and tedious campaign, having been 112 days and nights continually under fire, sleeping many nights in the trenches, fighting at every opportunity, always holding the ground and routing those opposed to us, and finishing the campaign with great honor to ourselves, to the State and to the General Government. General Sherman says that we will rest in the city for thirty days, and I believe him. I don’t have any Yankees in my own attic, but my wife does. We have a mixed marriage, you see. Sorry for the lack of substantive posts lately; I’ve had other things I’ve been focusing on (above). Here are some small stories that don’t necessarily warrant posts of their own. The National Museum of Civil War Medicine will hold its annual meeting at Kennesaw on October 3-5, 2014. Looks like a great program. Sean Munger has a great post on how Columbus’ voyage of 1492 traces back directly to the fall of Constantinople to the Ottomans almost forty years previously. If you’ve seen the new AutoTrader Dukes of Hazzard video, you may notice that the General Lee doesn’t appear to have a Confederate flag on the roof anymore, even though they shot the car from low angles where it’s not so obvious. GQ has the strange story of Christopher Knight, “the last true hermit,” who disappeared into the Maine wilderness for 27 years — sort of. I guess James Montgomery-Ryan has forgotten that he promised to start killin’ Yankees weeks ago. Anti-tax guru Grover Norquist — the drown-the-government-in-the-bathtub-guy — went to Burning Man this weekend and had a blast, calling it an example of “a bunch of people who think the government doesn’t need to be here. . . [it’s] Hayekian spontaneous order.” Except for the fact that the whole thing is held on federal lands and licensed by Cliven Bundy’s friends at the BLM. Teenagers in New York caught red-handed vandalizing a CW monument. They haven’t caught the clowns yet who tagged the J.E.B. Stuart monument in Richmond Sunday night. Luca Iaconi-Stewart is building an insanely-detailed mdoel of an Air India Boeing 777 out of manilla file folders. Over at The Bitter Soutnerner, writer Fletcher Moore and photographer Brett Falcon set out to retrace Confederate General Hardee’s attempt to flank Sherman’s army outside of Atlanta. At True Blue Federalist, Chris Shelley has three great posts exploring Lincoln’s views on race. Definitely worth your time. There’s increasing evidence that fatty, sugary, processed foods are not only bad for you physically, but mentally, too. I’m looking forward to Eric Wittenberg’s upcoming book, The Devil’s to Pay, on John Buford at Gettysburg. An Unlikely Blockade Runner, cont. Riverboats at the cotton docks at Mobile, c. 1900. The scene in 1863 would not have been much different, when boats like these were pressed into service as blockade runners. LoC image. Although I’m not very familiar with their capabilities, I wouldn’t have thought steamboats to be a very effective blockade runner. They would seem to have been too slow, from what little I know. Were Confederate officials simply hoping to sneak these types of ships through the blockade, or did they have the capacity to make enough speed to have a decent chance? That’s a great question, and it underscores that in the last post I neglected to explain very well why Bagaley would be considered an unlikely candidate for a runner in the first place. Let me see if I can do that now. Riverboats like William Bagaley were, by the 1850s, a very distinct and specialized type of vessel, optimized for work on the Western Rivers (i.e., the Mississippi, Ohio, Missouri and their tributaries). In the arrangement of their machinery, and particularly their hull construction, they were very ill-suited to make long passages on open water. They were generally of very shallow draft, and their hulls were of light construction, braced with wooden trusses and iron rods. The main deck of a fully-loaded riverboat was often barely above the level of the water. Western Rivers boats were generally built without external keels and, having lots of superstructure, would be prone to drift off to leeward in a strong wind. They could manage well enough on a calm day with a flat sea, but anything more unsettled than that could be a serious problem. Not that riverboats didn’t ever make a passage in the open Gulf of Mexico; many of them did make relatively short runs along the coast. The large majority of the 200+ steamboats that operated in Texas on the Sabine, Neches, Trinity, Brazos and Rio Grande had been built on the Ohio or Mississippi, and made the transit to Texas from the mouth of the Mississippi through the Gulf of Mexico. But those were relatively short runs, and generally in sight of land. It’s a whole different thing, in my view, to set out on a three- or four-day passage across the Gulf from Mobile to Havana or another port in Cuba. Fuel is another problem. Riverboats in the Deep South generally burned cordwood, which is enormously bulky. Boats generally stopped to wood at least daily, if not more frequently. Boats sometimes towed wood barges along behind them, or lashed alongside, but that would severely limit their speed, and doesn’t seem to have been done in this case. Carrying four days’ fuel would have taken up a LOT of space that otherwise might have been used for an outbound cargo. And it had to be enough fuel for the whole trip, since (unlike more conventional, seagoing steamers), these riverboats didn’t carry a rudimentary sail plan that could be used to help them get by when the wood started running low. So, yeah, it’s just a little bit nuts to try something like this with a riverboat. But the fact that there was a fairly large-scale, coordinated effort to use riverboats in this way speaks both to the urgency of Confederate government officials in wanting to establish a viable blockade-running system out of Mobile, and a willingness on the part of boat owners, whose vessels had been largely idled by the war and the near-elimination of maritime trade in the Gulf of Mexico, to try just about anything to turn their fortunes around. After the escape of the Florida, it took time for a blockade-running system to develop at Mobile. While Helm continued to stockpile munitions in Havana, officials at Mobile began to hire steamers for runs to Cuba. Two were the prewar coasting packets Cuba and Alabama; however, the majority of the contracted ships were flat-bottomed river steamers from the Tombigbee-Alabama River system. These vessels were not designed for use on the open sea, but their carrying capacity of hundreds of bales of cotton overruled any objections to their unseaworthiness. At Mobile, agreements were worked out by the Quartermaster Bureau with the owners of the Alice Vivian, Crescent, Kate Dale, James Battle, Lizzie Davis, Planter, Warrior, and William Bagley [sic.]. The basic contract called for an appraisal of the steamer by two individuals, one appointed by the government, the other by the owners of the vessel. A set value for the vessel was then determined and, if the ship was lost, one-half of this amount would be pa.id to the owners by the Confederacy. The expense of the expeditions was equally shared while the private owners provided the crew. The Quartermaster Bureau furnished cotton that would be carried to Havana and sold, and the profits were evenly divided between the two parties. The return cargo was also split, with the government half being provided by Helm. On return to Mobile, the ship would be reappraised and, if her value was found to be less than when she left Mobile, the difference would be paid to her owners by the government. The contracts were eagerly sought by steamship owners. The greatest attraction was the fact that the Confederacy would supply the outward cargo of cotton, thus saving the owners the expense and trouble of gathering the staple. Though their profits were not as high as if they owned the entire cargoes, their risks were less and they would receive compensation if their ships were lost. 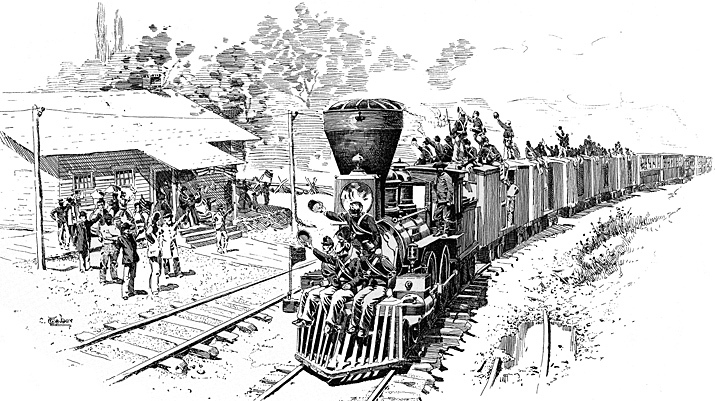 or captured, with the fast Union steamer De Soto accounting for five of the losses. We know what became of Wiliam Bagaley and James Battle; they were captured on their first run out of Mobile for Havana. What about the others? Alice Vivian was a 175-foot-long Alabama River sidewheel packet, built at New Albany, Indiana in 1856. In 1859 she was running a regular mail packet service between New Orleans and Memphis (right). She ran out of Mobile the first time around June 12, 1863, and returned safely from Havana around July 15. She was captured on her second run out of Mobile on August 16, 1863, by U.S.S De Soto and sold at Key West for $237,300.83 — almost all of which must have been for her cargo. Three attempts at the blockade, two successful. Crescent was a 146-foot sidewheel steamer renamed Nita for the purposes of blockade-running. She made two successful runs out of Mobile to Havana, in April and June 1863, but was captured by De Soto on August 17, 1863 while on her second return voyage to Mobile. Four attempts at the blockade, three successful. Kate Dale was a large sidewheel riverboat, 193 feet long and 428 tons burthen, built at New Albany, Indiana in 1855. She ran out of Mobile in July 1863 and was captured by the U.S.S. R. R. Cuyler on July 14 near the Tortugas. She was subsequently sold at auction to private buyers, who then sold or leased her to the U.S. Quartermaster Department. She burned on Mobile Bay in May 1865. One attempt, captured. Planter — not to be confused with the steamboat Planter stolen by pilot Robert Smalls at Charleston in 1862 — was a 156-foot sidewheeler built at Wheeling, (West) Virginia in 1860. She ran out of Mobile in mid-July 1863, and was captured on July 15 by U.S.S. Lackawana. She was sold by the prize court to the U.S. Quartermaster Department, and sold again to civilian interests in 1866.One attempt, captured. Warrior was a 130-foor-long sidewheeler built at Mobile in 1857. She was captured by U.S.S. Gertrude on her first attempt to run out of Mobile, on August 17, 1863.One attempt, captured. So out of these seven vessels (including Wiliam Bagaley and James Battle ), only two — Alice Vivian and Crescent — successfully made a complete, round voyage (one each), Mobile-Havana-Mobile. Five were captured on their first run out. It’s a terrible record, particularly for that period of the war. The seven ships together made twelve one-way attempts to pass through the Yankee blockade, only five of which were successful (about 42%). Marcus Price, the historian who tallied up attempts by blockade runners throughout the war, calculated that during 1863 in the Gulf of Mexico, steamers made 99 attempts at the blockade, of which 73 were successful. On any given run, three out of four typically got through. In fact, the actual odds were probably better than that for the others, given that Price’s totals include these sad-sack cases out of Mobile. The lesson, I suppose, is that riverboats make terrible blockade runners. Make a note. The Fall 2014 issue of the Civil War Monitor is available online now, and should be appearing on newsstands and in subscribers’ mailboxes soon. As always, Editor-in-Chief Terry Johnston and his crew have taken a little different angle on the conflict and its participants. This issue includes sesqui-stories on the Battle of Nashville, and a visitor’s guide to touring Franklin. An article by Craig Warren on the famous rebel yell is notable not only for its discussion of the yell on the battlefields of the Civil War, but its use and reputation after — during Reconstruction, at San Juan Hill during the Spanish American War, and later. Warren reminds us that, like that other iconic symbol, the Confederate Battle Flag, the rebel yell’s use and meaning didn’t end with the echoes of the last guns at Appomattox. It is, in fact, open to question whether Light-Horse Harry [right] was as die-hard as his son claimed in his loyalty to state over nation. The elder Lee had been a fierce nationalist during and after the War for Independence. If, after the ratification of the Constitution and Washington’s two terms as president, he had decided that his state was more important than the Union, it is a wonder that he did not shift his political allegiance to the Jeffersonian Republicans, the party that became the beneficiary of the Anti-Federalist legacy. Instead, Light-Horse Harry spoke passionately against the Virginia and Kentucky Resolutions of1798 (in which James Madison and Thomas Jefferson introduced the idea of state nullification of federal laws), denounced Jefferson and his presidency, and, like other Federalists, distrusted the public and feared the growing excesses of “wicked citizens. . . incapable of quiet.” If states could override federal laws such as the Alien and Sedition Acts, he predicted, insurrection and disunion would be the result. “If we love the Union,” wrote Light-Horse Harry, “if we wish peace at home, and safety abroad; let us guard our own bosoms from a flame which threatens to consume all reason, temper and reflection.” He did not condone disunionism in his own time, so it was unlikely he would have approved the creation of the Confederate States of America or his son’s prominent involvement in fighting a bloody war for the southern nation. . . . These were the very things his father had warned his countrymen to avoid at all costs. In short, Lee’s decision to take up arms against the United States went against the very things that Washington and his own father stood for. I told ya, it’s gonna raise some hackles. LaFantasie’s manuscript will not be the last word on Lee, of course, but it does poke a sharp stick in 150 years of far-too-generous evaluations of Lee, the man. The Civil War Monitor was founded to be a new sort of CW magazine, one that challenges traditional ideas about the events and personalities of the war. It’s not the magazine you want to be reading if you’re looking for reassurance that what you always believed is The Truth. “Broken Promise” forwards those colors. Do yourself a favor and subscribe today. Back in 2010 I started this post about Lt. Colonel Benjamin Franklin Carter of the Forth Texas Infantry, but never finished it. Carter started out as commanding officer of Company B. He was promoted to Major in late June 1862, and advanced to Lieutenant Colonel two weeks later, on July 10, 1862, and commanded the regiment at Sharpsburg. 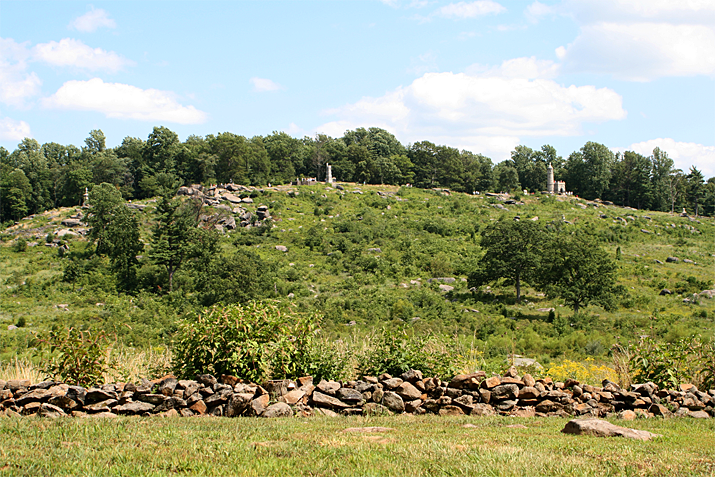 Carter was grievously wounded during the Texas Brigade’s assault on Little Round Top at Gettysburg on July 2, 1863, struck by shell fragments in the face and legs. He lingered for almost three weeks, dying on July 21. My post was occasioned by a June 2010 news story, describing the placement of a marker at his gravesite. [Lieutenant Colonel] Carter asked the doctor if there might be some gentleman in town to whom he could appeal for a Christian burial. When the doctor told McClure the story, McClure went to the hospital to visit Carter. Within days Carter died and McClure asked that he be buried in the Presbyterian burial grounds. The request was unanimously denied by the church members. Every other church in town also refused to allow Carter to be buried in their cemeteries. Finally, with help from a member of the Methodist Church, a burial plot was allowed in the Methodist Cemetery and Carter received a Christian burial there. For 33 years Carter lay in that grave with a granite headstone until the cemetery was sold, along with the Methodist Church, to the Brethren congregation. When the church decided to enlarge its facilities, the only way it could build was into the burial grounds. Forty-seven graves of people who had no one to claim their bones, including Carter’s, were disinterred and taken to the Cedar Grove Cemetery and buried in a single grave with no head stone. It was said that Carter’s stone probably was used as ballast when the concrete was poured for the new section of the church. Benjamin F. Carter was born in Tennessee in 1831. At the time of the 1850 census, eighteen-year-old Carter was teaching school in Giles County, Tennessee. After completing Jackson College, he relocated to Austin, where he worked as an attorney. He served a term two consecutive one-year terms as Austin’s mayor in 1858 and 1859. In the 1860 census, he is listed as 29 years old, with a wife Louisa and two daughters, ages 1 and 3. He reported owning $2,000 worth of real estate, but did not report any personal property. He is not listed that year as a slaveholder. Of the ten original captains who went to war in Virginia with the Fourth Texas regiment in 1861, six of them were lawyers, two merchants, one a farmer and one a stockman. Of the thirty lieutenants, nearly one-third were lawyers. Of the fifty sergeants, fifteen were lawyers, and of the 1500 men who served in that old regiment from the beginning to the finish, there was no end to lawyers and law students. Of course there were not enough offices in the regiment for all of them. Lawyers in war are like lawyers in peace, they go for all that’s in sight. They held the best places in the army and they hold the best places in civil life. It’s a mighty cold day when a lawyer gets left if chicken pie is on the bill of fare. Captain B. F. Carter of Company B was far above the average of men as you meet them. Intellectually, he had no superior in the regiments. A fine lawyer, a natural born soldier, he was a strict disciplinarian, but practical and just in all things. He possessed the gift of knowing how to explain every maneuver set down in Hardee’s Tactics so thoroughly that the biggest blockhead in the ranks could understand them Physically he was not strong and the long marches used to weary him very much. On those occasions, to help him along, the boys would divide up his luggage, one taking his sword and belt, another his haversack and canteen another his blanket, and so forth. By this means we managed to keep him up. . . . There was not an officer in Hood’s Texas Brigade in the Army of Northern Virginia who was more universally loved and admired by the soldiers of that old command than Lieutenant Colonel Ben F. Carter of the Fourth Texas Regiment, whom I have mentioned earlier. He was the very soul of honor, full of the milk of human kindness, yet at times he appeared harsh and cruel, especially to those who did not know and understand him. . . .
After our arrival at Richmond [Virginia] in the summer of 1861, many of the men were sick from exposure and change in climate. They were sent to various hospitals in the city. Captain Carter would send someone every day to see how his boys were getting along, but would never go in person to see them. He would buy and send them little delicacies, and to some of the prodigal fellows who never had a cent he often sent money.He manifested the greatest interest in his men and nothing the quartermaster could issue was too good for old Company B — but he strictly avoided coming in contact with the sick and wounded. He often spoke of this peculiarity, or apparent indifference, explaining it by saying that he could not bear to see any one suffer, and that he had a perfect horror of a sick room. Giles was writing long after the war, of course, so his profile of Carter undoubtedly includes a certain nostalgia, along with the knowledge that Carter did not survive the war. Nonetheless, it offers a vivid portrait of the man, and evinces affection and respect. Part 2 of the news story is here. Carter portrait via user AUG351 at Civil War Talk. Please use the full, formal name and drop ’em in the comments. Update: Closing comments for now, as I think I have enough units to work with. Thanks for the suggestions. 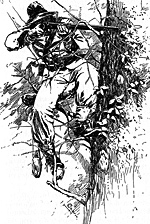 Image: “Confederate Sharpshooter” by Walton Taber. Dead Confederates went “live” a year ago today. Since then we’ve had 190 posts (inclusive of this one), over 70,000 page views, and over 1,300 comments. Thanks, y’all. Image: “Off to War” by Walton Taber.